Clothing/Jewelry Description A Joliet District Soccer t-shirt, blue jogging pants with red and white stripes and blue sneakers with a white stripe. 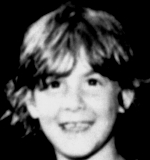 In January 1985, three and a half years after Sarah vanished, police thought they saw her picture in the apartment of David R. Collins. Collins, who has a long criminal record and uses many aliases, was charged with kidnapping one teenager in California and sexually abusing several others in New Orleans, Louisiana. 25 pictures of young girls were found in his apartment; police published them in newspapers in hopes that the public could identify the people in them. One of the subjects in the pictures was believed to be Sarah, but was eventually identified as another person. One other photograph was thought of be of Nelida Del Valle, a nine-year-old who disappeared from Massachusetts in 1976, but this possibility was also ruled out. Collins is not believed to have been involved in either girl's case. Police dug underneath an old garage on Noel Road, south of Joliet, in 2004. They were hoping to find Sarah's remains. They did find some clothing, but they could not find any evidence relating to Sarah's case. Updated 6 times since October 12, 2004. Last updated December 12, 2013; age-progression updated.